You take a deep breath in and let an equally deep sigh out. A rare moment of silence greets you back. Nice! No one is needing you for the 10th emergency of the day, you’re not waiting for the repair man, your presence isn’t being demanded anywhere. Everyone is safe, everything is calm. And there is bliss in this uninterrupted moment as you reach for your coloring book, prop your feet up and dive into your latest masterpiece. But almost immediately, You sense a problem. As you lay into that design, you feel… something. Maybe your thoughts wander and you can’t seem to reign them in? Maybe you’re thinking about things that are getting you in the Feels (making you feel genuinely terrible)? Isn’t settling down to color supposed to fix all of that?, you wonder. You begin to think you’re doing it “wrong”? It’s something – that you know for sure but you can’t quite put your finger on it… You’re struggling to get going but you don’t know why. Sit still for a few seconds – what do you hear? That total blissful silence is probably the cause of your creative coloring mojo drying up. During any given design time, you can find me blasting some type of music to get my creative juices flowing. According to this NY Times article, when our minds wander, we tend to start thinking about unhappy things, which is decidedly not a good thing when you’re trying to make designs or when trying to get relaxed with your coloring. But putting on some music, especially music that we love, can help us feel better, which gets us re-focused on the task at hand, which makes it a more pleasant experience. Music helps us to get “in the flow” – that state of mind where time is suspended and our pistons are firing fabulously, allowing us to write that awesome story or crochet that afghan or color in that great piece of art. And I have to say, it’s true. Not a stitch of an idea to begin laying out. I double check to see if I may have left some important bit of business unattended: I cross all my T’s, dot all my I’s and try again. Fresh board, I psych myself up – GO! At this point I’m getting frustrated. I’m thinking of calling this design time quits because ALL of my design fairies, my muses, my inspirations are nowhere to be found. Until I remember the one crucial part to my routine that I usually forget: music. 2) I tried to plow through it without music because every five seconds, it seemed the workmen were either interrupting me or creating so much noise that I couldn’t hear my tunes anyway, so I tried to forego the musical ear candy. Biggest mistake ever. Without my tunes, I was never able to get “in the flow” because my mind wandered aimlessly about everything else I had going on, except the most important thing right in front of me: my work. Needless to say, I missed deadline. Though there are no deadlines when coloring (unless you’ve entered a contest, then Uh-Oh – finish this article so you can use my tips, then get to it! ), it can be frustrating to finish a piece when the coloring inspiration/motivation is just not coming to you. But don’t fret! I am here to share my Top 3 “In The Flow” Music Tips to get your creative coloring juices running, your productivity producing and best of all, it won’t cost you a thing. Nope, not a cent. Ready? Read on! I generally have a disclaimer at the bottom of my pages advising that I use affiliate links for all my Amazon books, which is always true for any and every print book you purchase using links from my site. However, there are no affiliate links with these music recommendations. I’ve just found that they really work for me when I’m struggling with getting in the flow and I thought I’d share. So I hope you enjoy! 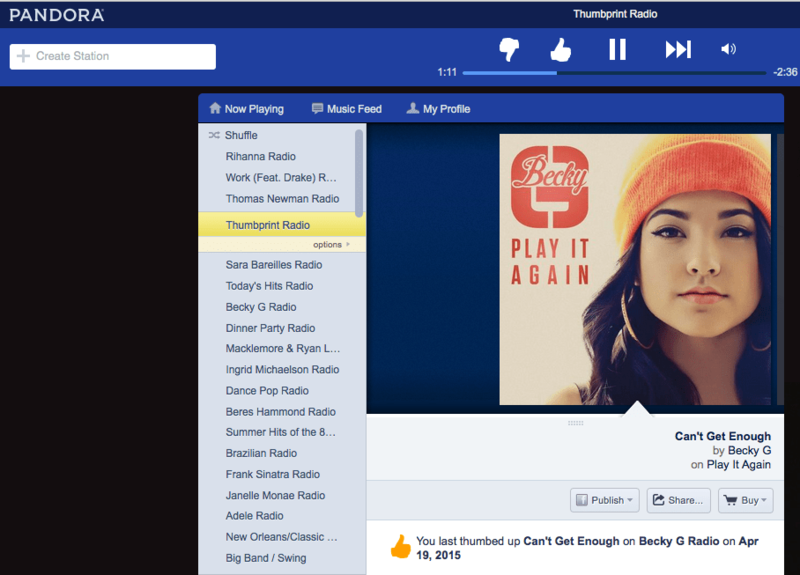 I *love* Pandora! It was a gem of a suggestion from a writing comrade and it has migrated with me through several different points in my life. I currently have 19 custom stations. Yes, you read that right: 19. I love that it gives me options to thumbs up or down songs that they serve up. The more songs that you like, the more songs that are similar to that one that they play for you. All you need to get started building your own stations list, is a valid email address to create an account and you’re ready to go! To welcome you to your new music home, check out my favorite station on Pandora, by far, Swing & Big Band. Yes OuiCreators, Youtube contains more than funny cat videos, recipes or how-to’s. I know, that shocked me too. While looking for super soothing music to allay my super shot designing nerves, I hopped onto Youtube and expected to have to play DJ between designing my coloring pages and picking out music. To my surprise, I found folks who had their already curated playlists available for anyone to partake. I was so happy! I found a playlist that had about two hours worth of music added to it and just pressed play. And for two hours, I was totally taken care of musically. Sweet! 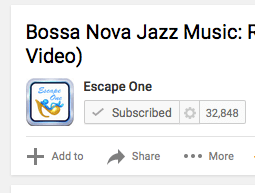 Up side: If you have a Gmail account you can create your own Youtube account, search for your particular flavor of music and add “playlist” to the end of it (so “jazz playlist” would be your search term) and then just pick from a playlist that looks like it will work for you. Even if you don’t have a Gmail account, you can quickly make one, for free. Once you find a playlist you like, you can save it to play again by clicking on the + Add To button (see image below) beneath the video of that playlist. This will give you a chance to quickly create/name your playlist, where you can save the playlist you just found. You can quickly add your playlists by pressing this! To get you going, here is my FAVORITE Youtube Playlist by the Escape One channel. What Is It: A digital audio file made available on the Internet for downloading to a computer or portable media player, typically available as a series, new installments of which can be received by subscribers automatically. Technically, this isn’t music but stick with me. Podcasts are also generally synonymous with Apple products. Some of us have been very fortunate to be able to afford an iPhone or iPad, etc…while some of us just arrived to the party (I’ve only been able to afford an iPhone within the last 3 years, and that was through saving my fiction book royalties for an entire year – so I get it). The great thing is, you don’t have to own an Apple product in order to take advantage of these FREE podcasts. You can download iTunes on your computer OR you can use an online client called Stitcher, which allows you to build your own podcast stations. The cool thing about Stitcher is that it allows you to play your podcasts on your computer with little fuss. You don’t even have to make a sign-in if you don’t want to. Which leaves more time for what? That’s right, coloring. Keep in mind with these suggestions, that volume and the music you pick makes a HUGE difference with your “in the flow” results. Some days, I want Enya blaring loud enough to annoy Penelope Dog AND the neighbors on either side. Some days just a slight bit of Macklemore bumpin’ in the background is enough to carry me through a five design streak. Go with what you’re feeling that day and do what works for you. By no means is this an exhaustive list. These are just the tried and true things that I have found to be reliable and true blue through all of my color related needs. I hope you try one of my Top 3 In The Flow Music Go-To’s For Colorists. Leave a comment below and let me know which one you’re planning on trying, which one worked for you or share how you change your environment to get inspired and motivated when struggling to find your creative coloring mojo. I have a lot of interesting coloring related articles scheduled – so stay connected by joining the newsletter here. Remember to check out the Marketplace for any of the Oui Color coloring book items mentioned in this post. Don’t forget to join the exclusive Oui Color Coloring Books Facebook Group, where you’ll join other awesome OuiCreators, you’ll have early access to contests, challenges, giveaways and discounts. Besides that, they are a pretty dang awesome group of folks – We’d love to have you, so come on over. Affiliate Disclosure: In the spirit of full disclosure, I use affiliate links for my books and/or some of the items I recommend. Which means that I may get a small commission if you decide to purchase anything from the Oui Color Coloring Books site. I only recommend products &amp; systems that I use and love myself, so I know you’ll be in good hands and you’ll never be charged more. Excited about coloring but not sure what to expect? Then take a few of my pages for a test drive, absolutely FREE. Calm • New Mandala Coloring Book! Love In Any Language • New Literary Series Coloring Book! Lotus • Mandala Coloring Book!